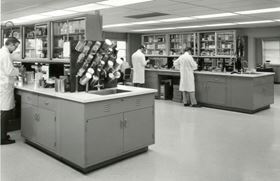 One of Chem-Trend's Research and Development Laboratories in the '70s. Chem-Trend, headquartered in Howell, Michigan, USA, provides products for the polyurethane, die casting, rubber, tyres, as well as for the composites, thermoplastic and wood composite industries. Chem-Trend’s founder Peer Lorentzen began to experiment with the development of release agents for polyurethane foams in the 1950s. He learned of the automotive component industry’s beginnings in the use of moulded polyurethane foam for automotive seat cushions and the difficulties being experienced by many manufacturers. Plain floor wax was used at that time to separate the moulded polyurethane cushions from the mould, causing high scrap rates and downtime. Lorentzen’s new release agents made polyurethane foam moulding easier, more reliable and more cost efficient. Most importantly, the gain in productivity obtained by moving customers from hand wiping waxes to spraying tailored release agents in liquid form made the mass production of moulded polyurethane seats possible. Today, Chem-Trend has manufacturing sites in North and South America, Europe and Asia, and sales offices around the globe. Since 2004, Chem-Trend has been part of Freudenberg Chemical Specialities KG, a member of the Freudenberg Group based in Weinheim, Germany. Chem-Trend and its parent company Freudenberg Chemical Specialities (FCS) have expanded its facilities outside Munich, Germany.